The Thrill of Love dramatises the true story of Ruth Ellis, the last woman to be hanged in Britain, following her shooting of lover David Blakely on Sunday 10 April 1955. It uses the character of a Detective Inspector Jack Gale (Chris Rogerson) to tease out Ruth's story, by sympathetically and warmly unpicking her confession. We are introduced to the theme of the play by Ruth (Rachael Stronge) stating ‘I am guilty. I am rather confused’. We are subsequently invited to speculate on the troubled state of mind behind the actions of this self-confessed violent murderer. Facts of Ruth's circumstances are less spelt out than implied which is a little frustrating but teases a desire to search out more, compelling to a degree a sustained focus on D.I. Gales' revealling of circumstances. Does the play deliver on revealling the truth behind this notorious case? It does and it doesn't in my view. The stage set was delightfully stripped to the bare essentials, and all the better for it. The story was well balanced, being told through the voices of Ruth and her three work colleagues, using the role of the Detective to tease things out. Chosing the Detective as the character to tease things out though, I think, compromised the scope to tell a fuller and more rounded story actually. This rather whitewashes the role of the police, historically and certainly at the time of Ruth Ellis, in dealing with domestic abuse cases - ironic at best given the focus of this play. As Amanda Whittington said when writing the play "I think in a well-known case like this you need to read between the lines and search for new truths within. I wanted to go beyond historical record, and look at Ruth’s life in the light of what we now know of her – and of the consequences of sexual abuse, exploitation and domestic violence on women. The sense of detachment showed after her arrest was more likely to be post-traumatic stress than the ‘equanimity’ her doctor recorded." 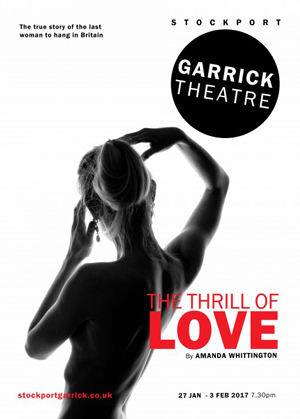 There's a tension between the title of the play 'The Thrill of Love', and the desire to look at Ruth's life through the politically scripted lenses of domestic abuse. The balance is skewed away from the thrill of Ruth being in love with a dashing racing driver from rich background, and even the disappointment from having her acheivement of being manageress of the Little Club in Knightsbridge taken away from her by her having to subsidise David Blakely from the profits of the club. Facts are revealed, and others left out, by the Detective in a peverse reversal of the way the police and judiciary used to approach domestic abuse cases, ina way that weaponises the domestic violence narrative through rose tinted spectacles. As Amanda Whittington says "I began to reimagine the facts of the case through their eyes and experiences, and in doing so, a new story came to life." There was too little thrill or love in the script for me. Given the contrainsts of the play, structurally it is great fun and works very well to tell this contemporary story through Ruth Ellis's ultimately tragic life. The sparring between Ruth's friend Sylvia Shaw (Sarah Field), who helped develop her from hostess to manager of her own club, new hostess Valerie Mewes (Samantha Wilde) and hired help Doris Judd (Emily Field) was a treat. Even with the limitations of having the Detective draw out the story, this allowed a warm and empathetic story to come out very well. There seemed to be a few first night nerves, but once relaxed into their flow, these three female characters helped draw out the purpose and courage of Ruth who was played superbly by Rachel Stronge. Despite the gravity of the story, I think Ruth could have allowed herself to smile a little more - she was supposed to be in love after all. The interchanges between the female characters expressed a touching and warm practicality born out of self-reliance that was unusual delightfully delivered. The attention to detail in the production meant that the story was very believable and endearing. The pre-amble in the programme was also very informative and useful in its extra detail. I must say that it was my first visit to Stockport Garrick and for a volunteer theatre it was a highly professional stage production, very polished performance onstage and having a wonderful front of house setup. I volunteer for several organisations and this was very well polished, which is credit to all concerned and bodes well for the future of the Stockport Garrick, which has a fabulous history and deserves all the success in the present it can get. There's something very honest about volunteer organisations and this production came across as just that. Alas the poster's tagline advertising the play seems to have exaggerated things a little with 'The true story of the last woman to hang in Britain'. It's a dramatisation of the story of Ruth Ellis, light on telling the facts, and a little too skewed towards a contemporary #meetoo message - brilliantly done, but not the true story.